Brand new Twilight Home under construction located in the Mariposa neighborhood. 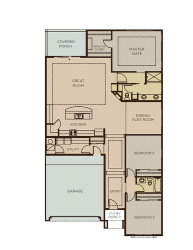 This popular San Giuliano floorplan features 2,068sf sf with 2 bedrooms and 2 bathrooms! Buyer can still make interior selections. Samsung appliance packages, 18 x 18 ceramic tile, granite countertops in the kitchen and bath, maple cabinetry and 2- tone paint are just some of the features offered! Contact us today to find out all the Twilight Homes offers!